Manny "Nightmare" "StaticManny" "Oni Heero" "All Might" "Static" "Spark"
For the Super Smash Bros. Melee Sheik main from California, see Smasher:Spark (Melee). For the Smash 4 and Ultimate Roy main from Texas, see Smasher:SparK. For the Smash 4 Bowser main from Delaware, see Smasher:Static (Delaware). 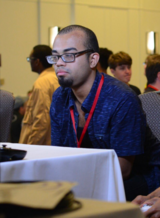 Manny (currently sometimes Nightmare, formerly known as StaticManny, Oni Heero, All Might, Static, and Spark) is a smasher from Tampa, Florida who mains Sonic in Brawl and Smash 4. He is considered to be one of the best Smash 4 Sonic players in the world along with KEN, komorikiri, 6WX, Wrath and JaKaL. He has set wins over top players such as Tweek, Dabuz, Elegant, WaDi, Mistake, ANTi, ESAM, Samsora, MVD, and Shuton. Manny is currently ranked 1st on the Tampa Smash 4 Power Rankings and 39th on the Panda Global Rankings 100. Manny popularized the name of Smash 4 Diddy Kong's former infamous KO string, the "Hoo-Hah", by shouting it at Hungrybox during his match against Diddy player Player-1 at Paragon Orlando 2015 whenever the latter performed the down-throw to up-air combo. Manny is notorious for his frequent name switching. Humorously, during Smash the Record 2016, Manny went by the name "Spark the man with manny names". Manny also used the prefix "Toomannynames" at Showdown: Battle Royale 2 in reference to his frequent name changes. This page was last edited on February 24, 2019, at 11:05.